Williamsburg, Virginia is a delightful destination to visit any time of the year, but something special happens here every fall as this quaint village prepares to celebrate Christmas. For the past seventy years, what is now known as “Grand Illumination” has been the official start to the Christmas season in Colonial Williamsburg. This event falls on the first Sunday of December and draws thousands of visitors every year. Colonial Williamsburg, an 18th century village, in the heart of Williamsburg covers over three hundred acres and made up of eighty-eight original houses, shops, and public buildings reconstructed on their original foundations. 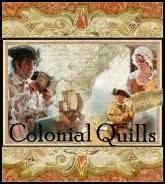 Through fastidious research, every effort has been made to recreate the 18th century colonial capitol. 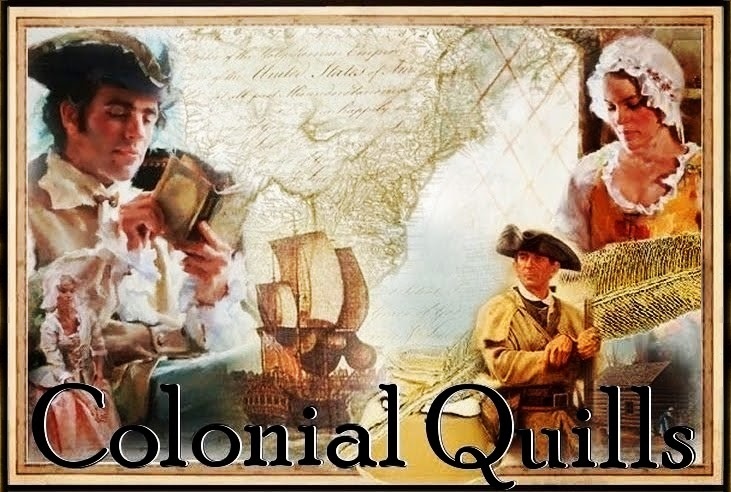 Visitors to the historic area will see, hear, and experience a living history lesson about government, religion, the trades, homes, shops, taverns, clothing and culture as they go about town and chat with the colonial garbed and knowledgeable staff. 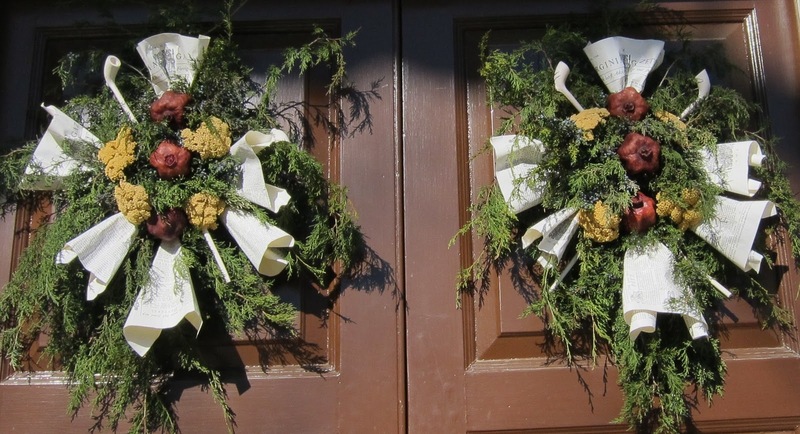 Eighteenth century Christmas celebrations in Virginia were primarily of English origin and limited to attending religious services, very modest gift giving, and families and friends gathering for feasting and singing. Outdoor decorating in colonial times was practically non-existent. 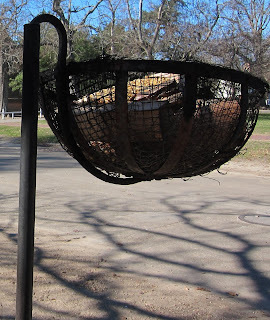 Colonial Williamsburg began including adornments in the 1930’s in an effort to accommodate more modern traditions. The decision was made to use only materials which were available locally during the colonial period, thereby not compromising authenticity. They use materials such as apples, oranges, pineapples, berries, pomegranates, lemons, as well as herbs, vegetables, dried flowers, shells, feathers, holly and other greenery arranged in wreaths, swags and roping. Perishable items in these decorations are replaced as needed throughout the season. Decorations are designed according to their ultimate destination. 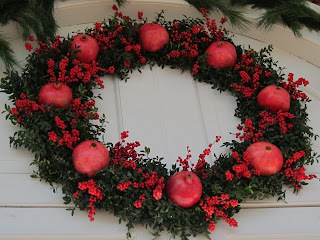 For example, dried flowers and other heartier materials are used on doors that get an abundance of sunshine, with the more perishable fruit and vegetables used in shadier areas. The main thoroughfare in the historic district is Duke of Gloucester Street. 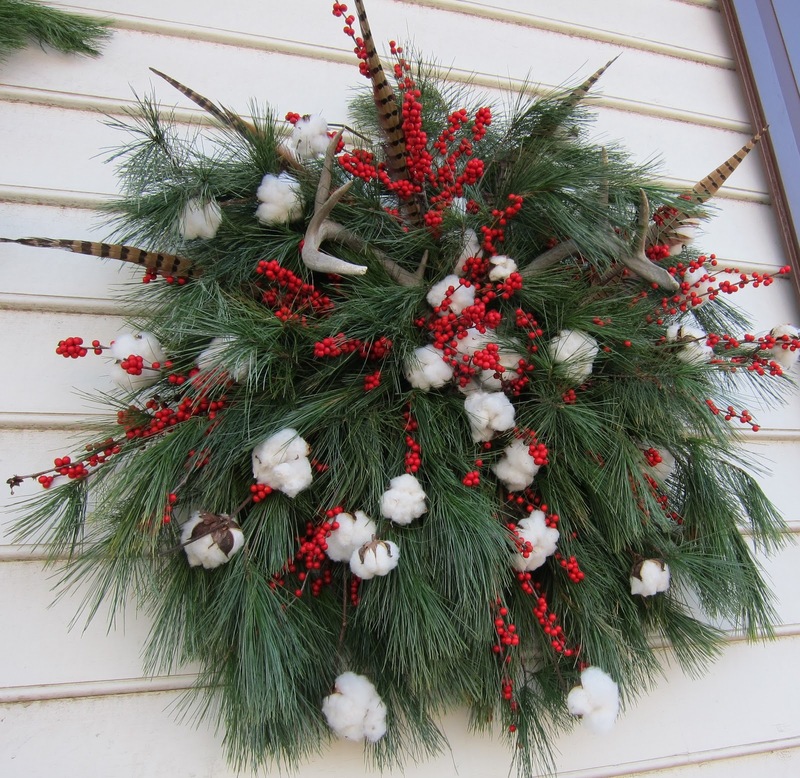 During a daytime stroll at this season one will see practically every door decorated with original, professionally designed wreaths which will be judged and awarded ribbons in various categories. similarly themed ornamentation; however they usually are affixed in the corners to allow for the visibility of the candles that will be lit at dusk. As evening approaches battery operated or electric candles (obviously a break with the colonial tradition) are lit in every window throughout the town. This Williamsburg tradition has caught on with visitors and is now practiced all around the country. At dusk, bonfires are lit at various locations and “cressets” that line Duke of Gloucester Street will be set aflame. 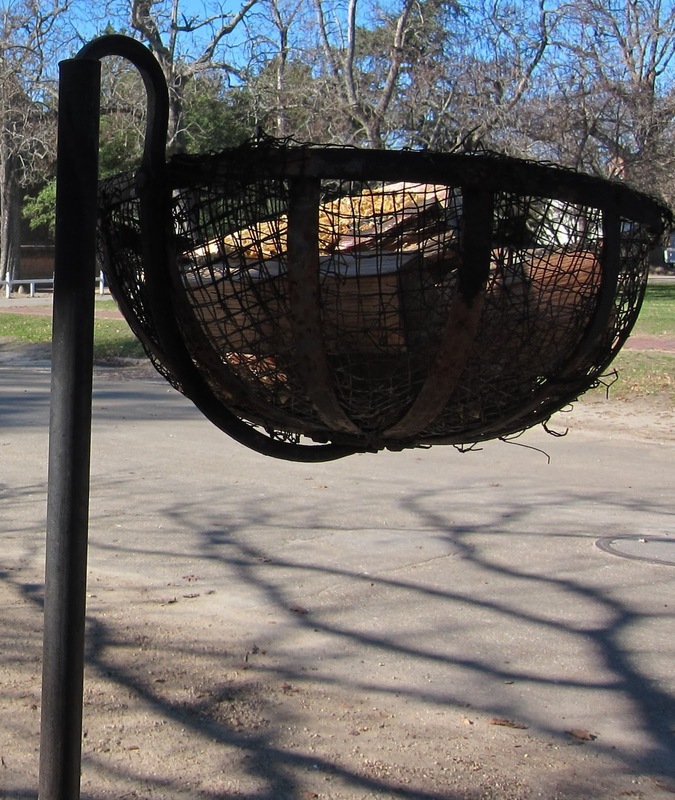 These wrought iron poles and baskets, 6-7 feet in height, are filled with a resinous pine, thereby providing lighting for the colonial streets. Throughout the day and evening hours, market stands in the historic area provide visitors hot cider, coffee, chocolate and cold refreshments as well as bakery items. The taverns furnish an authentic 18th century eating experience for hungry visitors. An a cappella group from the College of William & Mary, located at one end of Duke of Gloucester Street, as well as other singers and musical programs perform on outdoor stages throughout Colonial Williamsburg. A spectacular fireworks display, launched simultaneously from three different sights, the Governor’s Palace, the Magazine and the Capitol is the culmination of a wonderfully festive evening. It’s no surprise that visitors return year after year. Janet, beautiful post! Love those cressets! The emphasis back then on simpler things like faith and family (and food;) is something I wish we could return to! When I think of decorating beautifully I always think of Colonial Williamsburg. Thanks for such an uplifting holiday post! God bless you. It sounds so beautiful! And the pictures of all the greenery sure are. A lovely post indeed, Janet! It was a wonderful day and evening for Grand Illumination this year. Thank you, Ladies, for you kind words. I missed the Grand Illumination but plan to get out to see all the decorations. It is so pretty at night, too, with the fires going. Since you can't make it to the Grey Goose for the party on Saturday maybe we can do lunch at CW soon? Love this post, Janet! Someday I'm going to make it to Williamsburg for Christmas--it looks just lovely! Wow, I'd love to go visit this. Janet, Bless you again for this pretty post! I keep coming back just to look at it!!! Williamsburg has so much to offer all year long. And you can visit Jamestown and Yorktown on the same visit. A delightful place to live!